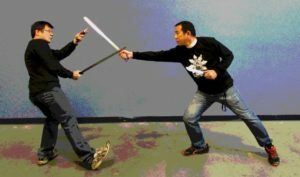 Louie D. Lindo is the head instructor of Ikatan Kali Canada and the unofficial Godfather of FMA in Vancouver. 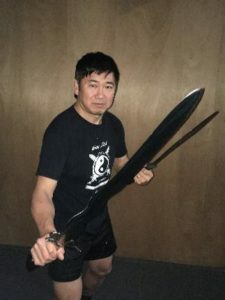 He has cross-trained in various Filipino-Indonesian martial arts since 1985 in the USA, Canada, and Philippines under Dan Inosanto, Richard Bustillo, Dave Lear, Greg Lontayao, Tony Diego, Rey Galang, Norman Suanico, Herman Suwanda, and Edgar Sulite in Kalis Ilustrisimo, Villabrille, Lameco, Lucaylucay Kali, Doce Pares, Balintawak, Pekiti Tirsia, and Mande Muda. He continues to teach beginners, advanced students, instructors, military & law enforcement in the Philippines, North America, and Guam. Tom Dy Tang, is the recognized torch bearer of Kalis Ilustrisimo as Grandmaster Tony Diego's longest student and logging the most training time in the art. Tom was meticulously trained by Mang Tony in Manila to be his successor upon his passing and currently teaches a small private group in Vancouver. For more information: FMA_Informative-Issue184.pdf. Kenneth Co has trained in various martial arts in the Philippines before focusing on FMA for the past 13 years. As a practitioner of Kalis Ilustrisimo he has also trained with GM Tony Diego in Manila and regularly trains with both Tom Dy Tang and Louie Lindo. Brent Matsuda has been training in FMA since 1988 in Canada, USA, Australia, and Philippines, including 20+ years under Louie Lindo. He is a graduate of Bahala Na Martial Arts (Giron Escrima) in Stockton, California and a Senior Associate Instructor under the Inosanto Academy in Los Angeles. He is the Head Instructor of Warrior Zen Martial Arts (WarriorZenMartialArts.ca) and teaches Jeet Kune Do and FMA at Ancient Fire. Bring rattan training sticks, training knife, safety goggles/glasses, and if you have them, padded stick, padded knife, training sword, hand and forearm guards. While we may not use all of these, it is better to have them on hand than wishing you brought them after the fact. Brent Matsuda at brent.matsuda(at)gmail.com or 604-788-2224.